I debated whether to make this pattern this month, since it’s so close to Valentine’s Day, but obviously I decided to go ahead with it. This particular design was actually one of the first I sketched out, but I just hadn’t gotten to it yet. In fact, it’s a lot of the reason I extended this series beyond a year - I just couldn’t not make this one. It would be perfect for the holiday, but not out of place afterward, because really, when isn’t love in season? Using the tree pattern, cut two from the brown fabric, one InsulBright, one batting and one interfacing (I missed the batting in this photo). 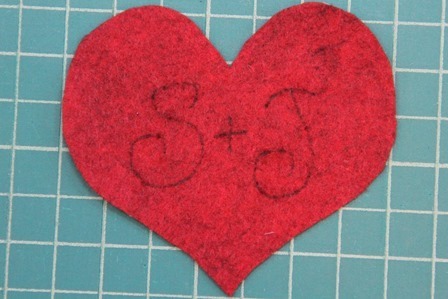 Cut one heart from felt. 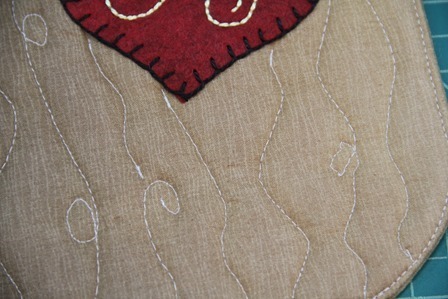 If your felt is thin you may want to add some fusible interfacing to the back. Cut four leaves from the green fabric and two from the batting. 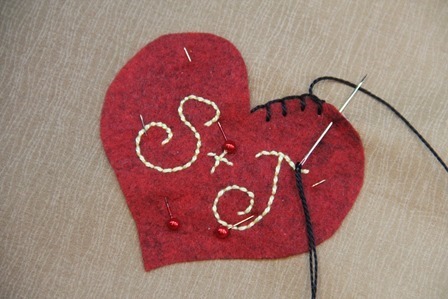 Apply the interfacing to the tree and heart. Lightly draw the initials you’d like on the heart with a fine tip marker. 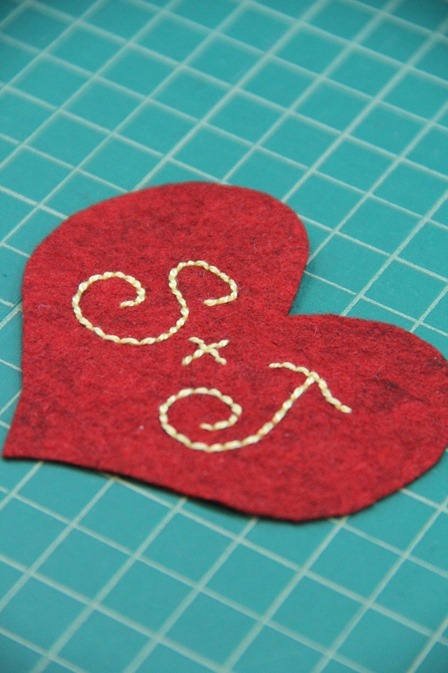 Embroider the letters onto the heart with craft thread using a backstitch. 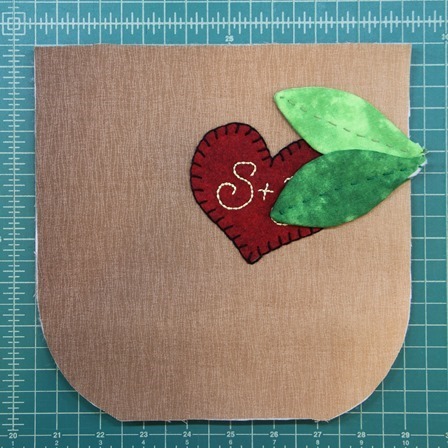 Pin the heart to the tree and stitch in place. 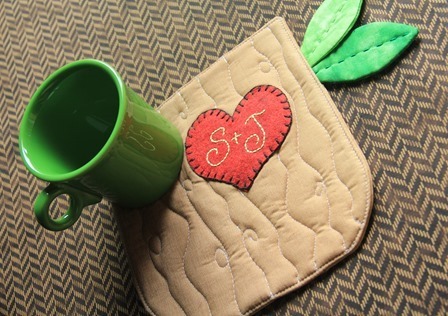 I used a blanket stitch, but any favorite will work. 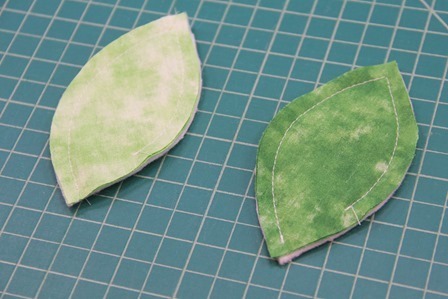 To make the leaves, layer the batting, one leaf right side up and the other right side down. Stitch around the outside, leaving about an inch open for turning. Clip the corner. Turn right side out. Press, turning in the opening. Don’t worry too much about that tip, because that will be hidden inside the hot pad. 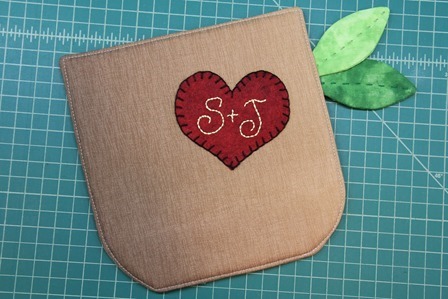 Add some decorative stitching with craft thread. I drew more veins on the pattern, but decided I actually liked the simpler look. Layer the tree InsulBright, the piece with the heart, right side up, and the two leaves about 2 1/2” down from the top with the tips sticking outside the tree about 1/2”. 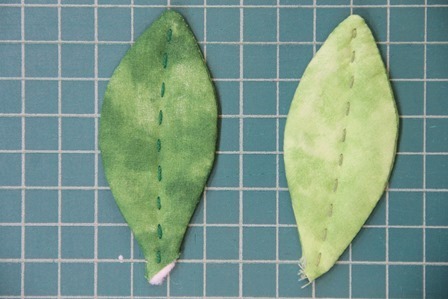 Add the remaining fabric tree, right side down, and the batting, Pin in place and stitch around the edge, leaving 3” open at the bottom. Clip the corners. Turn right side out. Press, turning in the opening, and topstitch around the entire tree. To create the bark effect, add some rows of free-motion quilting. If you’re unfamiliar with that technique, check out this video from Missouri Star Quilt Company. It’s something that gets easier with practice, and it’s been a long time since I’ve done it, so my stitches are pretty wonky. I also forgot to change my presser foot. Even with all of that, I’m happy with the way it looks. Since we’re going for bark, there’s nothing wrong with it being a little rough. With that, we’ll add the Sweethearts Tree to our growing collection of hot pads, all made using the same shape!